4.1 Commutation of Pension means payment of lump sum amount in lieu of a portion of pension surrendered voluntarily by the pensioner based on a duration of period in relation to the age. This is purely an optional facility provided by the Government to the pensioner. The duration is fixed with reference to age as number of years’ purchased. If the age at the next birthday of a retiring employee is 59 years, he will be entitled to get 10.46 year’s portion of pension he surrenders. If the pensioner is eligible for the pension of Rs.2000 and he opts to commute 33 1/3 % of the amount he will be entitled to receive Rs.65,113 as follows: 2000 x 33.33 x 8.14 x 12 / 100 Originally, the maximum portion of the pension that could be commuted was one half of the pension and it was reduced to 1/3 in 1960. As per G.O. 174 Fin 21.04.1998, the maximum rate that could be commuted from 01.04.1998 is 40% of the pension. From 01.04.2003, the maximum limit for commutation portion of pension is 33 1/3% of pension (G.O 74 Fin 19.03.2003). 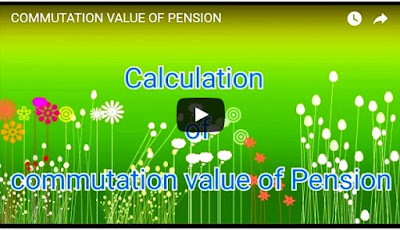 From 01.04.2003 the Government have approved a new commutation value table under Rule 7 of the Civil Pension Commutation Rules 1944. (G.O 135 Fin 30.04.2003). As per this revised table if the age at the next birthday of a retiring employee is 59 years he will be entitled to get 8.14 years of portion of pension he surrenders. If the pensioner is eligible for the pension of Rs. 2000/= he opts to commute 33 1/3% of the amount he will be entitled to receive Rs. 65,113 as follows. 4.2 The Commutation of pension was subject to certification by medical authority to the effect that the Pensioner’s physical health and prospects of duration of his life are such as to justify commutation. With effect from 28.02.1978 this condition was relaxed to the extent that in case the commutation is opted within one year of retirement, the medical board certificate is not necessary. He is at liberty to commute the portion of the pension at any time after his retirement but he has to produce medical board certificate if it is done after one year of retirement. In case of compulsory retirement, medical certificate is essential even if it is done within one year of retirement ( Letter 1909/87-3 Fin 07.09.1987). From 1985, the option to commute the portion of the pension has to be indicated the regular pension application form which the employee has to be submit normally one year prior to his date of retirement and no separate application for commutation is necessary G.O.989 Fin10.09.1985 . 4.3 If he commutes a portion of pension, such portion of the pension shall be deducted from his monthly pension for a period of 15 years from the date of such commutation. The commuted portion will be restored after 15 years by the pension disbursing officer. i) Reckoning of 15 years period for the purpose of restoration of commuted pension will be from the date of retirement if the commutation was simultaneous with the date of retirement. ii) In other cases, from the date of commutation like cases of further commutations allowed during revision of pension on II, IV Pay Commission reports. iii) All commutations whether 1st or 2nd or subsequent commutation for which authorisation was issued by the Accountant General or Pension disbursing officer prior to 07.12.1990, shall be treated as past cases and commuted portion of pension will be restored without insisting on any condition, on completion of 15 years from the date of retirement irrespective of the date of commutation. iv ) All applications submitted to the Accountant General prior to 07.12.1990 but authorisation from him received after 07.12.1990, are treated as past cases and to be restored after 15 years from date of retirement (G.O.242 Fin 01.04.1981,302 Fin 04.05.1981 letter 108043 / 92 – 1 Fin 30.10.1992 ). 4.4 Commutation shall become absolute on the date of application by Government employee or from the date following the date of retirement which ever is later or at the end of the 3 months after the issue of authorisation by the Accountant General for payment of commuted value of the pension or date of next birthday of pensioner whichever is earlier. ( G.O. 788 Fin 23.07.1985, 42 Fin 13.01.1987, letter 13224 /86 – 2 Fin 09.06.1986, Rule 9A of Civil Pension Commutation Rules). 4.5 In case of commutation based on the medical examination, the commutation shall take effect from the date on which the medical authority affix signature on the medical certificate / report. (G.O.558 Fin 11.08.1993 ). 4.6 A Commutation once given effect to can not be rescinded and commuted portion restored on refund of its capitalised value. 4.7 If the pensioner dies on or after the day following that on which commutation took effect but before receiving the commutation value, such value shall be paid to his heirs. Annexure III Under Rule 12 of the C.P.C. Rules provides for nomination to receive commuted value of pension in the event of the death of the pensioner. (G.O.307 Fin 13.05.1982 ). 4.8 Commutation is not permissible in cases of employee who retires without prejudice to the pending disciplinary proceedings. If the proceedings are finalised with punishment, commutation shall be allowed based on the date on which final orders are issued. Where he is exonerated, commutation shall be allowed on the original application and value will be decided with reference to the age at the time of retirement. (Letter 98690/93-5 Fin 07.06.1995) After finalisation of proceedings the employee has to submit a fresh application for commutation and in case he dies before the proceedings are finalised, commutation shall be allowed on the pending application with reference to the age in his original application letter 13767 / 92 – 6 Fin 07.10.1992, 11057 / 93 – 7 Fin 05.04.1995. 4.9 Restoration of commuted portion of pension has to be done by Treasury with out insisting life certificate and formal application from the Pensioner. Rule 2(iii), G.O. 41 Fin 13.01.1987 letter 72119/91- 19 Fin 10.07.1992. 4.10 Restoration of commuted portion of Pension by the Public Sector Banks is allowed. (Letter 56364/98 Fin 17.03.1992).